The Battle of Arras commenced on April 9, 1917 and the Newfoundland Regiment soon found themselves in the thick of it. Just before midnight of April 14th, 1917 the Newfoundlanders moved forward in single file to the firing trenches on the eastern outskirts of Monchy-le-Preux, a small French village located about 8 km south east of Arras. In the inky darkness the men proceeded at a snail’s pace through the littered fields, picking their way among the dead horses which lay in disordered piles covered with a thin mantle of snow. It was two o’clock before the Battalion reached their new position. The Brigade’s task was to seize the enemy’s front line, Shrapnel Trench, and capture Infantry Hill, 1000 yards east of Monchy-le-Preux, pushing out detachments that would establish protective strong points across the front and along the flanks of the advance. The two-battalion attack was to be carried out by the 1st Essex Regiment (on the left) and the Newfoundland Regiment, under a creeping barrage. The Newfoundland assaulting Companies were “D”, commanded by Captain Herbert Rendell, on the left, and “C”, under Captain Rex Rowsell on the right. Each would advance in two waves. Keeping direction posed no problem, for clearly visible from the Assembly Trench were the Bois du Vert, the north end of which gave “C” Company a bearing on which to advance, and on the left a small wood on Infantry Hill, which would guide “D” Company to its objective. 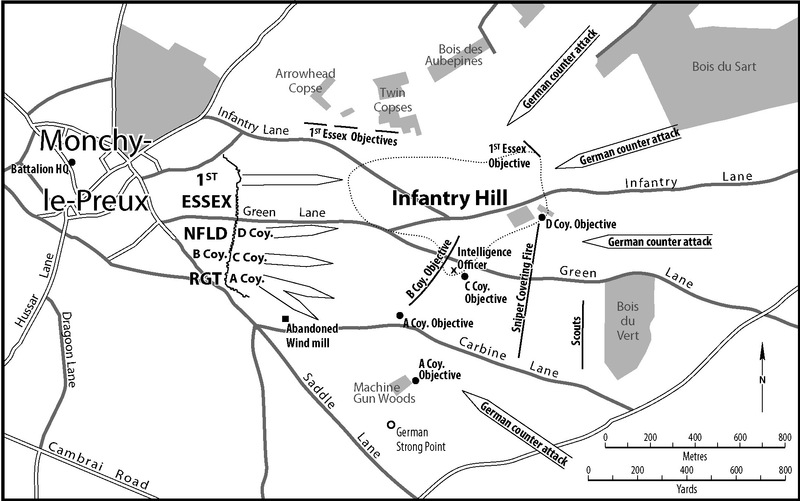 While the advance of the Essex Regiment would cover the Battalion’s left flank, there would be no corresponding external protection on the right. The important responsibility of securing this flank was given to “A” Company (Lieutenant I. G. Bemister). Earlier that night “A” Company had prepared a strongpoint, the first of four such platoon posts which it was called on to do, established along the Battalion’s southern flank. Of these the key point would be in a small copse called Machine Gun Wood, about 500 yards to the right of “C” Company’s objective, and some 700 yards in front of the Bois du Vert. The Brigade order made provision for the Newfoundlanders’ subsequent advance once the initial objectives were attained. While the barrage stayed on the Bois du Vert the Regimental snipers and scouts, sixteen of each, would advance on the right of “B” Company under the Battalion Intelligence Officer Lieutenant Bert Holloway. They would attempt to get as far forward as possible and when the artillery fire lifted they would attempt to gain the near side of the wood. If they succeeded, “C” and “D” Companies would each rush a platoon forward to develop strong points on the eastern edge of the Bois du Vert. The snipers and scouts would again press forward, their progress being observed from “C” Company’s original strongpoint on Infantry Hill by the Intelligence Officer, who would, if he deemed it feasible, call on “B” Company to leapfrog further patrols forward. On the 88th Brigade’s left the Essex Regiment was charged with similarly sending out patrols. The small force was to advance, unsupported on the flanks, against a position which when captured would form a salient, and hold it against possible counter-attack by incalculable numbers of the enemy. The German shelling which harassed the troops in Monchy for most of the night fell off as dawn of the 14th approached. An unusual calm pervaded the scene while the Newfoundlanders waited in their jumping-off trench for zero hour. Watches were synchronized as the Colonel made his final rounds. An officer remarked, “It’s a fine morning, Sir.” “I hope it will be”, is the CO’s crisp reply. Zero was still thirty minutes away when a party of Germans were seen about 500 yards away moving towards a ruined windmill which stands in No Man’s Land beside the road angling south­eastward from Monchy to the Cambrai highway. A rattle of rifle fire from the Newfoundland right dispersed them. At 0530 hrs a lone shell overhead signaled the start of the barrage. The leading waves of “C” and “D” Companies mounted the parapet and headed for their respective woodland objectives. There was general agreement afterwards that the barrage had been deplorably thin, nothing like the solid curtain of fire laid down by the artillery at Gueudecourt. It failed to silence the enemy’s machine-guns, which almost immediately opened up across the whole front of the attack. The Newfoundlanders found Shrapnel Trench unoccupied, for the Germans had retired from it when the barrage opened. Within minutes the Germans replied to the British artillery with their own barrage. Monchy was heavily shelled, and as the Newfoundlanders advanced up the long slope of Infantry Hill, casualties came rapidly. On the left “D” Company, having overrun “A” German trench (Dale Trench) near the Battalion boundary attained its objective on the crest and began digging in. A number of Rendell’s men were seen advancing into the little wood beyond, but nothing more was heard of them. “C” Com­pany’s leading wave, having lost thirty per cent of its men to the enemy fire, reached its assigned position on the hill, halting for the second wave to pass through. Captain Rowsell sent two Lewis guns to the crest to cover these latter platoons as they dug in on the far side; but although the guns were later heard firing at intervals, neither they nor the infantry of the second wave were seen again. On the southern flank “A” Company captured the Windmill from a small group of Germans, and dropped off a platoon to entrench itself with a Lewis gun about 500 yards to the east. The remainder pushed forward to their objective at Machine Gun Wood and drove the Germans out. The plan to send scouts and snipers forward failed completely. Most of them became casualties to enemy shelling soon after the attack started, and Lieutenant Holloway was fatally hit when coming back to report that Bois du Vert could not be taken. All this had occurred in the first ninety minutes of the action. At 7:20 a.m. Brigade Headquarters received a telephoned report from the Essex that they had captured their objective and were con­solidating. There was no word from the Newfoundland Regiment. Runners returning with messages for Battalion Headquarters and wounded men trying to struggle back were shot down by snipers or machine-gun fire, reported to be coming from the valley to the south. Ten minutes after sending their success signal the Essex reported the enemy massing on their left front, in the vicinity of the Bois du Sart. The Germans were adhering to their doctrine of the “elastic defence”. Under this principle the defence no longer depended upon strongly fortified forward positions in which the infantryman would have to say to himself “Here I must stand or fall”. Under attack the front line would hold firm at some points and yield at others, denying to the British the advantage of a uniform rate of advance with constant artillery support. The Germans kept the bulk of their forces well back, and the main battle followed as the Germans launched counter-attacks on ground of their own choice, out of range and view of the British artillery. It was now about nine o’clock. Counter-attacked from three sides and with no sign of reinforcements, the survivors of the Newfoundlanders put up a desperate struggle against impossible odds. The forward platoons of the Newfoundlanders’ “D” Company were virtually surrounded by an estimated force of 500 Germans coming in from the Bois du Sart and another 200 from the Bois du Vert. They fought on until with the enemy only fifty yards away they were forced to surrender. About ten of them on the right of the line are reported to have made a break for it, but only one man got back to Monchy. It was the same grim story with “C” Company, where little knots held out here and there for a brief space until they were either killed or captured. The sur­vivors of the platoons manning the strong points tried to retire, but very few escaped the small-arms fire coming from the southern flank. Farther back “A” Company’s platoon at the southern end of the start line temporarily halted with its fire two companies of Germans until an enemy shell knocked out its Lewis gun. Back at Battalion Headquarters none of the messages entrusted to company runners had reached Lt Colonel Forbes-Robertson, and his only knowledge of the disaster that had befallen the Regiment came from the confused reports of excited and wounded survivors. Shortly after ten o’clock a wounded man of the Essex Regiment drifted in with word that all his battalion were either killed or captured. Forbes-Robertson at once sent his signalling officer, Lieutenant Kevin Keegan, forward to the Assembly Trench to reconnoitre the situation. Keegan was back in twenty minutes with alarming news. He reported that there was not a single unwounded Newfoundlander east of Monchy-le-­Preux, and that he had seen some 200 to 300 Germans advancing in extended order less than a quarter of a mile away. It was a time for prompt action. Forbes-Robertson immediately ordered Regimental Sergeant-Major White to fall in the Head­quarters staff and to collect every man that he could find. His intention was to hold off the German onslaught until reinforce­ments could come forward. With the telephone line to Brigade Headquarters broken, he sent Adjutant Raley back to report the critical situation. Then he led his little band, which numbered about 20 men, down the hill towards the enemy, picking their way between the broken houses of Monchy and arming themselves with weapons and ammunition from dead and wounded soldiers as they went. The enemy’s guns were still pounding the village, and a number were hit. But the intense shelling was encouraging evidence that the Germans had not yet entered Monchy. Lt.-Col. James Forbes-Robertson, Commanding Officer. Lieut. Kevin J. Keegan, Signalling Officer. Sgt. J. Ross Waterfield, Provost Sergeant. Cpl. Charles Parsons, Signalling Corporal. Lance-Cpl. Walter Pitcher, Provost Corporal. Pte. Albert S. Rose, Battalion Runner. Pte. V. M. Parsons, 1st Battalion, Essex Regiment. To this list must be added the name of the Battalion Orderly Room Corporal, Cpl. John H. Hillier, of St. John’s, who was temporarily knocked out by a bursting shell during the rush forward, and crawled in from a shell hole some ninety minutes later to join the little group. They at once opened a series of bursts of rapid fire on the enemy, who believing themselves to be opposed by a powerful force, quickly went to ground. It was now 10:50 a.m. For the next four hours these ten resolute men “represented all that stood directly between the Germans and Monchy, one of the most vital positions on the whole battlefield. Back Row: Cpl. A. S.Rose, Sgt. W. Pitcher, Lt.-Col. J. Forbes-Robertson, Lieut. K. J. Keegan, Sgt. C. Parsons, Sgt. J. R. Waterfield. Some of the men had received promotions since the Monchy battle. Every bullet fired by the defenders was made to count. With the need to economize ammunition most of the Newfoundlanders’ firing was done at close range. They could see large numbers of enemy soldiers crossing the forward slopes of Infantry Hill, but they reserved their fire to pin down the Germans in the Assembly Trench and Shrapnel Trench and to catch small parties attempt­ing to reinforce them. In the first two hours their bullets accounted for forty Germans, the CO’s deadly marksmanship being credited with three-quarters of these. And what was of greater significance, by picking off the scouts sent forward by the Germans to ascertain the strength of the force opposing them, the Newfoundlanders kept the enemy in ignorance of their pitifully weak numbers. Shortly before two o’clock, when enemy snipers had become less active and only an occasional shell was falling on Monchy, Lt. Colonel Forbes-Robertson sent his runner, Pte. Rose, back to Brigade Head­quarters with a report on the situation and an urgent request for reinforcements. He asked for artillery fire on Machine Gun Wood, which from the amount of movement in the vicinity appeared to be an enemy headquarters. Pte. Rose succeeded in delivering his message safely, and then, despite orders to the contrary, he again braved enemy bullets and shrapnel to make his way back and rejoin his comrades in their firing line. In response to the call for help Brigadier Cayley ordered up the Hampshires from his reserve. They reached the houses behind the Newfoundlanders at 2:45 p.m.; and at the same time the Divisional artillery began shelling Machine Gun Wood. Thanks to the heroic efforts of Forbes-Robertson and his men Monchy had indeed been saved. So ended the fighting on April 14th. The enemy’s achievement had been to recover the ground captured by the Essex and the Newfoundlanders that morning and to cut those two battalions to pieces. But they had thrown away the opportunity to retake Monchy, and the end of the day found the position of the front line unchanged. General de Lisle was not greatly exaggerating when he declared to the Newfoundlanders that if Monchy had been lost to the enemy on April 14th, 40,000 troops would have been required to retake it. Such is the measure of the achievement of the ten men who saved Monchy. A caribou now proudly stands on a hill in Monchy facing the former German lines. As soon as it was dark a platoon from the Hampshires came forward and relieved the Newfoundlanders. But there was still one more contribution to be made to the day’s heroism. Before they withdrew, Lieutenant Kevin Keegan went out with two of his men to bring in five wounded Newfoundlanders who were lying in a portion of the Assembly Trench unoccupied by the Germans. Back at Battalion Headquarters Forbes-Robertson collected another two dozen NCOs and men who had straggled in from the battle. Later that day the Battalion counted its losses. The fatal casualties were exceeded only by the number of those who fell at Beaumont Hamel; and one-quarter of the Newfoundland officers and men who went into action at Monchy-le-Preux became prisoners of war. The Newfoundland losses incurred from April 12 to 15, 1917, based on existing information, total 460 all ranks. Seven officers and 159 other ranks were killed (or died of wounds), seven officers and 134 other ranks were wounded and three officers and 150 men were taken as prisoners of war. Of these 28 died from wounds or other causes while in captivity. The courageous actions of the ten defenders of Monchy earned for them considerable accolades and respect from their comrades, their country and their King. The highest form of gratitude came in the form of the following awards. Brigadier General James Forbes-Robertson, VC, DSO & Bar, MC, was awarded the Distinguished Service Order. For conspicuous gallantry and devotion to duty when in command of his battalion during an enemy attack. He collected all the men he could find, and taking up a position on the outskirts of a village, brought the hostile advance to an end by his fire. He undoubtedly saved a very critical situation by his promptness, bravery and example. Captain Kevin J. Keegan, MC & Bar, was awarded the Military Cross. For conspicuous gallantry and devotion to duty. He displayed the greatest bravery and resource and by his personal example maintained a post against overwhelming odds, inflicting heavy losses on the enemy, who were completely checked. Sergeant Joseph R. Waterfield, MM. These soldiers received the Military Medal and their citations are identical. For bravery in the field. At Monchy-le-Preux on April 14th, 1917, when an attack had failed and the enemy were advancing on the village, he displayed the greatest of gallantry as one of a small party hastily collected to oppose the hostile advance. This party maintained itself in the face of overwhelming odds, inflicted heavy losses on the enemy and completely checked him on this part of the line. The Medical Officer, Captain Tocher and his Medical Sergeant, Sergeant Gooby, earned gallantry awards for their part in caring for the wounded who were unable to make their way back to Brigade HQ. Captain J. W. Tocher (Royal Army Medical Corp) was awarded the Military Cross. For conspicuous gallantry and devotion to duty. He displayed great courage and determination in attending to the wounded for many hours during an intense hostile bombardment. He set a fine example to all ranks. His Aid Post in a cellar was three times penetrated by shells, killing some of the wounded, but regardless of this he continued his work and attended the wounded throughout the day. Sergeant Archibald Gooby, # 154, was awarded the Military Medal. For bravery in the field. At Monchy-le-Preux on 14th April 1917, he showed great gallantry and devotion to duty. He went out under heavy shell fire and superintended the bringing in of the wounded from the front. He returned to the Aid Post through a heavy barrage for more stretchers, went forward again and collected more wounded. Afterwards he performed invaluable work helping at the Aid Post under an intense bombardment during which the Aid Post was blown in. The Newfoundland Regiment remained in the Arras sector throughout April and despite depleted numbers found themselves holding a position at Les Fosses Farm on the road joining La Bergere with Monchy. The Second Battle of the Scarpe was scheduled to commence at 4:45AM on 23 April. While many of the Divisions reached their destination, a strong German counterattack late in the day reversed many of the gains the Allies had made. All day the Newfoundlanders were under continual shelling and machine gun fire but stubbornly held their positions. By June the Arras offensive had ended and the Newfoundland Regiment was moved south west to Bonneville. Its fighting strength was down to a mere 11 officers and 210 other ranks.